Nose: The sherry is immediately present along with delicate dark fruits, figs, plums and dates. Lovely sweet with brown sugar, vanilla and a hint of milk chocolate. With time dumpy notes of tobacco leaves, touch of leather and fine oak arrive. Very aromatic and appealing nose. Improves with time in the glass. Palate: Bold and intense on the palate. Mouth coating and watering with lots of sherry, brown sugar, raisins, plums and dark chocolate. Becomes spicy and slightly dry with hints of oak, tobacco leaves and cracked black pepper, accompanied with delicate notes of cinnamon, toffee and vanilla. The spiciness increases with a second sip. Finish: The finish shows good length with warming and slightly bitter notes of dark chocolate, leather, black pepper and oak spice. Very chewy and tasty. With water: Soft and round on the nose when a few drops of water are added. Sherry, dark fruits and oak spice are still present. The spiciness and dumpy notes, however, are significantly tamed. Surprisingly less sweet on the palate with tamed sherry flavours and dark fruits. On the other hand, the spiciness and peppery notes increase along with dry oak, dark chocolate and tobacco leaves. The finish is medium long, warm and dry with slightly bitter notes of oak, leather and espresso. Comments: An enticing sherry character! 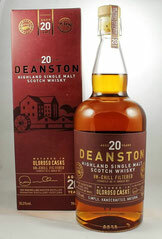 A bold, rich and luscious Deanston where sherry and dark fruits shine through all the way with great elegance and complexity. Good balance of sweetness and spiciness supported by a subtle dry and bitter backbone. No water needed as it masks the lovely sweetness and fruity flavours. Certainly one for the sherry aficionado. Nose: The sherry is obvious but very pleasant and not overpowering at all. Delicate fruity aromas emerge with plums, apples, peaches and tangerine. Soft, rich and creamy with lingering vanilla, toffee, bees wax and a whiff of oak. Very aromatic and appealing. You can nose this for hours. Palate: A sweet and fruity start on the palate. Lovely notes of tangerine, peaches and oranges complemented by an intensive load of spices - oak, cinnamon, and white pepper. The high alcohol content results in a significantly warming mouthfeel which is very pleasant. Becomes drier once the warmth fades away. Delicate flavours of dry plums and fresh hazelnuts linger with a delicate waxy note towards the creamy finish. Intense, but smooth and exceedingly flavourful. Finish: The finish is medium long and full of delicate nutty flavours. Sweet honey and tender fruity notes deliciously mingle with fine oak and a whiff of pepper on the tail. Creamy, even chewy and very tasty. With water: Water enhances the fruitiness on the nose with more apricots, peaches, and luscious oranges. Restrained sherry flavours, mixed with lingering toffee, vanilla, bees wax and a whiff of creamy oak. The fruitiness continues on the palate with apricots and peaches playing a dominant role. Spiced oak and black pepper mingle with cinnamon and dried dark fruits in the back. The finish is medium long, honey-sweet with sticky fruit and a soft spicy backbone. 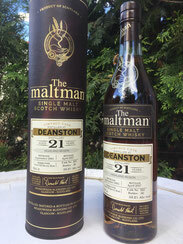 Comments: A stunning dram from Deanston with a gorgeous nose and a brilliant taste! Powerful but soft at the same time. Rich, complex with depth and a perfect balance of fruitiness, sweetness and warming spiciness. The oloroso sherry casks deliver a superb aroma spectrum without masking the distillery character. No water needed for this impressive and flavourful beauty. I thank Sascha Adamovic from Just-Whisky.de for the photograph!